Anyone walking through Edinbugh’s Filmhouse cinema in the last few years will have stumbled across Filmish, the lovely comic book treatments of film theory from Edward Ross. 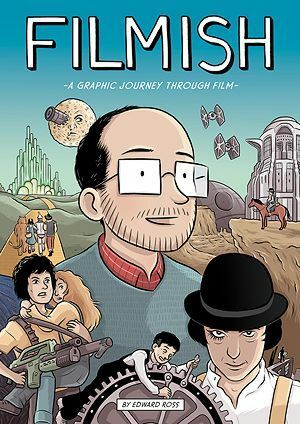 Under the same title, the artist and essayist has now expanded into a full graphic novel form with this fun and engaging journey through film history. Seven chapters each explore a specific critical concept, offering a solid overview of long-standing film theory from Laura Mulvey to Gilles Deleuze – if you’re looking for the ultimate intro to film, this might be it. However, distilling a hundred years of cinematic history (and over 300 film references) into 200 pages is no mean feat, and even those well-versed in the male gaze and technophobia will find rich reward on each page that lovingly celebrates classic images from the big screen. In the tradition of Scott McCloud’s Understanding Comics, Ross himself inhabits Filmish, guiding readers through his personal reflections on the subject. As he notes early on, while the medium has continued to evolve, its power to open up the potential of human vision remains undiminished. And so it seems, does the manner in which we discuss it. Out now, published by SelfMadeHero.